Alpine Retreat. Established in February 2015. That's us, Simone and Gavin, relaxing after a great meal with friends at Northburn Station, just out of ﻿﻿﻿Cromwell, shortly after first ﻿﻿﻿discovering Queenstown Lakes and Central Otago. We met in 2000, in Auckland, through dance, which is still a big part of our lives. We have traveled, lived and worked overseas, together and independently. 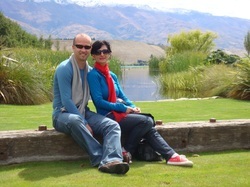 We both fell in love with this part of New Zealand and a plan was formed to make a permanent move. We finally found a magical property in Ben Lomond that was too beautiful to keep to ourselves and so we invite you to come visit. We look forward to providing you with a memorable stay in truly magnificent surroundings. We have been delighted to host many honeymoon and wedding anniversaries and special birthdays. ​You will be our only guests. ​​Simone is fluent in Italian and speaks some French. Gavin can work with you (see Retreat Offer and Rates) to improve your well-being with moving meditation and health coaching to ensure you leave feeling totally refreshed and re-energized. For cat lovers, we have two Burmese cats, Frank and Sam. The cats are not allowed in The Studio. However, if you suffer from cat or pollen allergies, we suggest you bring your antihistamine. Thanks for visiting us online and we hope to meet you soon.